I used to say, "I don't collect dolls, I just have a few that I really like." But recently, I counted my dolls, and I think it is safe to say that a grown woman with 25+ dolls, is a doll collector! 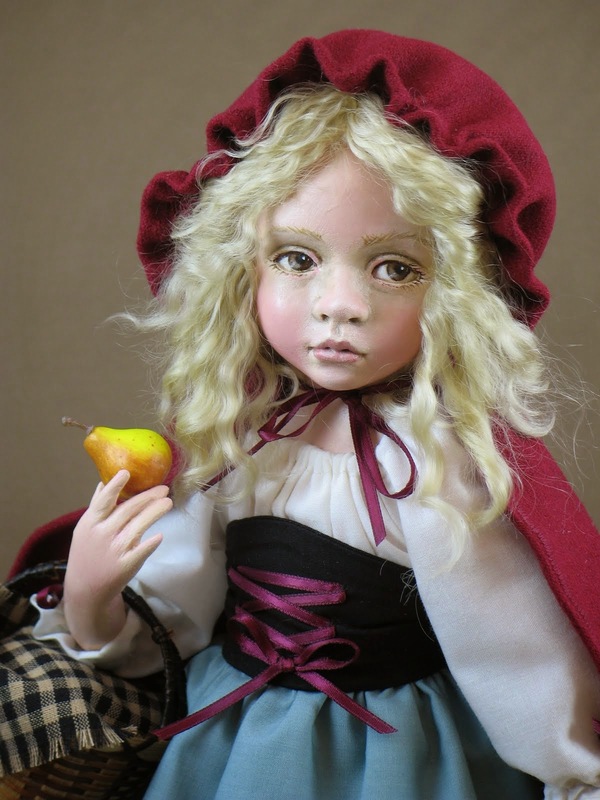 My recent doll obsession, (besides sculpting them) is BJDs or Ball Jointed Dolls. I mentioned in my last post that next weekend I will be attending a BJD Artist Workshop and Retreat. I could not be more excited about that! I am also looking forward to the arrival of my very first purchased BJD. Modern ball-jointed dolls are a unique collectible in that they are completely customizable. They are hand cast resin, and are often made in Asia (which is why they are sometimes called Asian BJDs). A collector chooses the sculpt, the hairstyle and color, eye color, clothing, and the face-up (how the face is painted). Many collectors will even do the face-up themselves. The other thing that makes BJDs so wonderful is, of course, the jointing. They have ball joints at the neck, shoulders, elbows, wrists, hips, knees, ankles, and sometimes at the waist too, making them able to pose in very lifelike ways. As soon as I saw them, I knew I wanted to add one to my collection (yes, to my doll collection) But which one? There are so many choices of companies and sculpts-- and that is even before you begin to think about customizing! I finally decided on Ange Ai Gaby from Custom House in Korea. I love her sweet face and small size. I also knew I wanted a child doll. Here is the picture of Gaby from their website. When my little doll arrives home, she will look very little like that photo. She will be bald, naked, and unpainted. She will also have some random eye color which the company chose (which could even be purple--not my taste) But she won't be like that for long! I have purchased a wig and some eyes for her, and have the materials necessary for giving her a "face up". 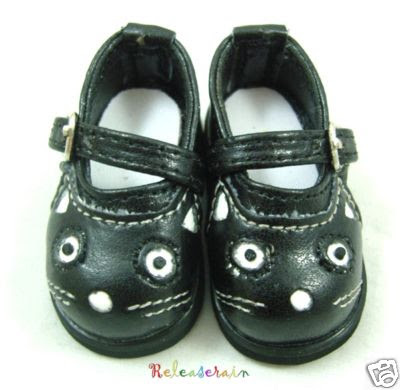 I also purchased some clothing patterns and an adorable pair of tiny leather shoes. I have been very busy making bears for orders, and I have a show coming up soon, but today, I gave myself permission to "play with dolls". 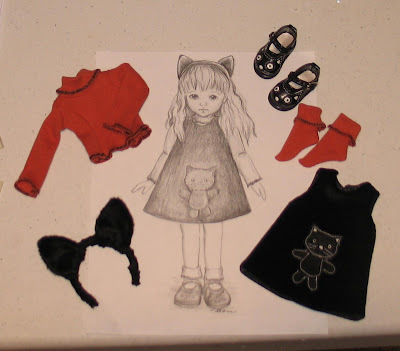 I think my doll will be arriving near the middle of next month, so I made a Halloween themed dress/outfit for her. The shoes I got have a cute black cat face on them and I fell in love with them, so I based the outfit design on the little cat face. I made a drawing of how I wanted it to look. I purchase a Bitty Bethany Pattern because the measurements seemed similar to Ange Ai, and made some simple alterations.I think the outfit turned out too cute! I hope it will fit her. 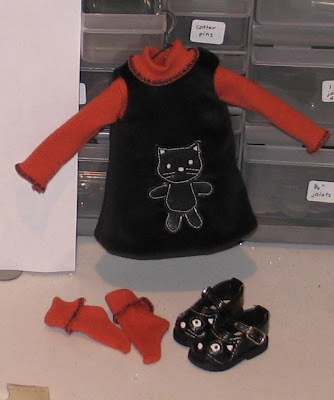 The jumper is black velveteen and I made the Kitty applique from very thin leather to match the kitty on her shoes. This will be her Halloween outfit, since I hope to display her with my Halloween bears and other decorations. I will have to make other outfits for other occassions. I'll be sure to post her pictures when she comes! Now back to Teddy Bears! I've been working on so many things at once that I have not been posting much, but I am still here and still making bears (and some bunnies, and some knitted scarves). Also, our power was out for a while due to the huge winds the hurricane sent us. In Ohio!!? Remember the post where I was contemplating whether or not I'd give up electricity before giving up making bears? I had a chance to try it out! What do you think I did during the power outage? I worked on bear on the screen porch and in the candle light until my eyes couldn't take it anymore! I am also very much looking forward to next weekend for a chance to get away and emerse myself in sculpting dolls and surround myself with passionate and talented doll artists at the BJD Artists Workshop Retreat!!! 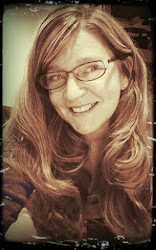 The forum for the retreat has asked for a photo, and I didn't have a recent one I liked (I have lots of cute ones from 2-3 years ago before I gained 20lbs!) So I asked my son, Alex to take one. He took a few, and then told me to hold one of my bears. Wouldn't you know that the photo of me with a bear was the one with the most natural smile! 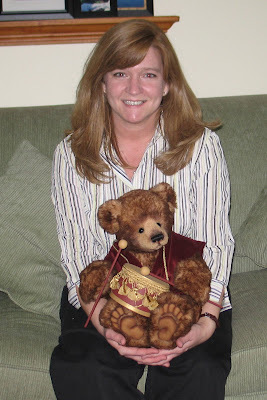 Here I am with The Little Drummer Boy, made for Teddy Bear and Friends magazine's Christmas feature. I'll bring my camera to the retreat so I can post some pictures here. It sounds liek we are going to be very busy though so I do hope I remember to use it!